A safari is an overland journey, usually a trip by tourists to Africa. In the past, the trip was often a big-game hunt, but today, safari often refers to trips to observe and photograph wildlife, hiking and sightseeing, as well. A Uganda safari to Lake Mburo National Park introduces you to different activities to enjoy while on your safari in Uganda. Horseback riding safaris in Lake Mburo National Park makes it unique. Lake Mburo National Park is the only park in Uganda which arranges game drives on horses. It is one of the best ways to view wildlife found in Lake Mburo National park. These horse arrangements are done by Mihingo Lodge that has a stable and trained staff to help you enjoy this. If you would wish to have a ride on a horse, you need to make prior arrangements. Games drives in Lake Mburo National Park are done during day. This is done while the visitors are seated in their safari vehicle for security purposes as well as better viewing. During game drives, tourists see variety of birds as well animals found with in the park for example the elands, impalas, antelopes and giraffes. Game drives is one of the best activities enjoyed by tourists on Uganda wildlife safaris. Night game drives are done during night hours. When going for a game drive, your safari guide is accompanied by a game ranger with a spot light torch to enable tourists see the nocturnal animals found in Lake Mburo National Park like bush babies, porcupines and all things that move at night in this park. 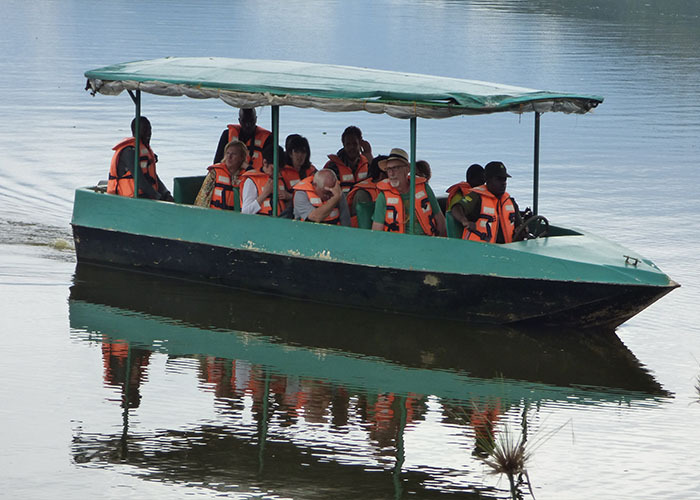 Boat cruise on Lake Mburo is another enjoyed Uganda adventure safari activity in this park. 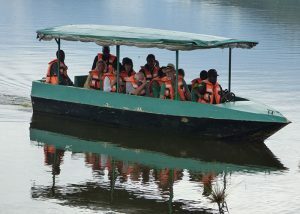 A Boat cruise on Lake Mburo offers chance to tourists to sight crocodiles, hippos in their natural home. Lots of other animals can too be sighted along the lake banks as they come quench their thirst along the lake. This is common during the dry season. Birding in Lake Mburo National Park for this park is one of the best places to do a Uganda birding safari. Lake Mburo National park has over 350 species of birds. Birders that have been to this park have sighted the rare shoebill here. Other bird species spotted while in the park include the grey crowned cranes, brown parrots, bateleur among others. Nature walks are also done in Lake Mburo National Park. This enables tourists interact closely with the natural environment. Nature walks can be taken anywhere in the park however the tourists must move with an armed guide from the Uganda Wildlife Authority for safety. While on a nature walk in Lake Mburo National Park, tourists often see wildlife animals like zebras, giraffes, elands, topi, antelopes, birds and so many butterflies. Sport fishing on Lake Mburo. Lake Mburo National Park is gifted with 5 lakes found with in the park. These include Lake Mburo from which the park name was derived. Lake Mburo has over 6 types of fish in the famous Lake Mburo however the commonest in Tilapia fish. Sport fishing along this lake is arranged at Mazinga. So, if you book you safari with us, we can arrange this for you to smoothen your safari. Biking safaris also exist in Lake Mburo National Park. Biking in Lake Mburo National Park helps visitors explore the park on guided bike rides. Riding among different animals in the park like zebras, buffaloes, antelopes is fun because tourists are excited about the experience. These bicycles are usually arranged by Africa all-Terrain Vehicles (ATV safaris). All those activities are so exciting and a vacation to Lake Mburo National Park will offer you memories. Copyright © 2019 Lake Mburo National Park Uganda. Powered by WordPress. Theme: Spacious by ThemeGrill.